After implantation, the placenta undergoes a period of explosive mitotic growth characterized by rapid synthesis and accumulation of nucleic acids and protein in trophoblastic and uterine tissues. In sheep, this period begins at around 40 days of gestation and ceases abruptly by midgestation at approximately 75 days, resulting in 50-fold and 30-fold increases in wet and dry placental mass, respectively (Fig. 1). Cessation of absolute placental growth is preceded by sharp peaks in rates of DNA and protein synthesis at 50 55 days of gestation, associated with a maximal rate of dry-matter accretion (Fig. 1). 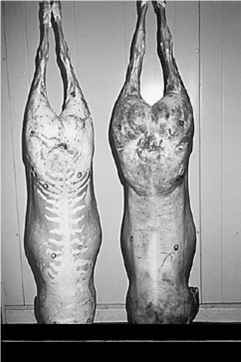 In the cow, hyperplasia of the cotyledonary placenta continues into late gestation, although at a diminishing rate, whereas in the pig, macroscopic growth of the diffuse placenta is complete by about day 60 or slightly after midpregnancy. Notwithstanding some species variation in pattern and timing, in all domestic mammals the phase of major proliferative growth of the placenta occurs in early mid-pregnancy and precedes rapid growth of the fetus in late gestation. This is significant because the trajectory of early placental growth can determine ultimate size and functional capacity of the placenta, and fetal growth during late gestation. The cessation or slowing of net placental growth after midgestation masks the continuing proliferative growth of the microvasculature, especially in the umbilical circulation, and the extensive remodeling that allows closer apposition of the uterine and umbilical capillaries. 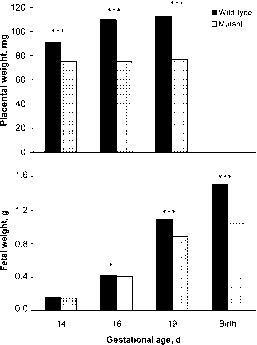 The wet mass of the ovine placenta actually declines during the latter half of pregnancy (Fig. 1A), mostly through loss of extracellular water associated with the loss of hydrophilic extracellular matrix (mostly glycosoami-noglycans) from the trophoblastic villous core after about day 90 of gestation. The degree of branching and total surface area of the villi and vascularization of the maternal caruncles increase during late gestation before plateauing two to three weeks before term, although vascularization of the villi continues to increase until term. Alterations in placental morphology after midpreg-nancy are associated with major increases in placental blood flow and functional capacity, including transfer of highly diffusible molecules and carrier-mediated transport of glucose and amino acids. are either identical to ones used in other organ systems (e.g., fibroblast growth factor's control of early stem cell proliferation), were coopted to take on new functions, or arose via gene duplication to take on a specialized placental function. Preliminary evidence suggests similarity of these functions between mouse and human, and probably, among other mammals. Insulin-like growth factor II (IGF-II) may perform a special role as a regulator of placental growth and funcional capacity. The IGF-II gene is paternally imprinted and abundantly expressed in multiple placental cell types. Selective deletion of a transcript specifically expressed in the trophoblast leads to dramatic stunting of placental growth, followed by fetal growth restriction in mice (Fig. 2). Thus, it has been proposed that the imprinted IGF-II gene controls both the placental supply of, and the genetic demand for, maternal nutrients to the fetus. More specific information on molecular regulation of the functional differentiation of trophoblast endocrine cells is reviewed in Soares et al.